Collaboration & Tower of Babel. Deep thinking. With the Internet we are now connected to people living in all parts of the world. With language translators available on Google and other places we can now understand each others words. Will this lead to future joint efforts to solve world problems? Is this possible? I've been doing a lot of thinking about the Biblical story of the Tower of Babel. I'm not a Biblical scholar, so today I did some searching and came up with a web site that provides a number of articles worth reading. I highlighted nothing that they propose to do will now be impossible for them because this is where I struggle in my thinking. Everything I've been trying to do through the Tutor/Mentor Connection and Cabrini Connections is get people to learn from a common body of aggregated information and apply that understanding in efforts to make programs and services available that help poor kids grow up better prepared for lives out of poverty. Yet while the Internet gives us access to each other and an unlimited range of ideas, it also creates a proliferation of places with their own gravitational pull, making it more and more difficult to build the critical mass of people involved in any single place. Is this just a continuation, or 21st Century version, of The Tower of Babel Story? I've much more learning and thinking to do on this topic. What are your thoughts? Have you tried to bring people together to solve a problem but you seem to meet with resistance in many different ways? This map was built using a tool that shows you a visual depiction of your Linked in professional network. You can build your own map by going to this link. See my map here. I'm connected to 577 people on Linked in. Some are from my college. Some are former Montgomery Ward execs. Some are peers. Some make giving decisions at foundations and corporations. Many are people who share the same concerns I focus on. My goal is that every day these people are reading my blog, looking at the links I point to and making an effort to share this information in their own network. My goal is that every day some of these people are sending us the resources (people, dollars, ideas) that it takes to operate Cabrini Connections, Tutor/Mentor Connection so we can do more to help people in this network use our ideas and the ideas of each other to help build more and better volunteer-based tutor/mentor programs in Chicago and other cities. 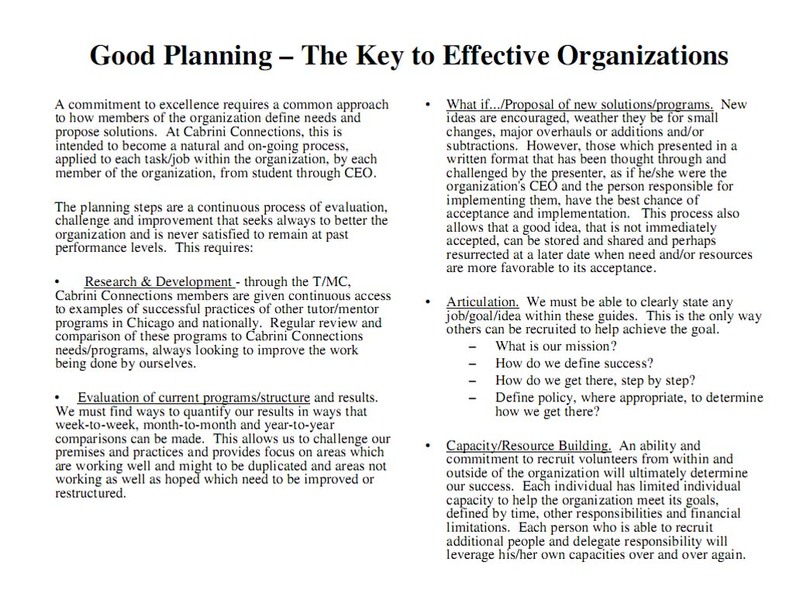 This pdf describes what I mean by "building a network of purpose". 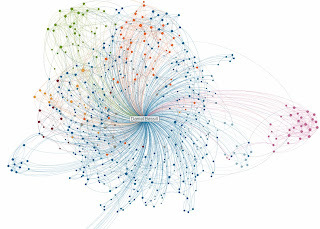 What does your network look like? How are you "nudging" it every day to help you with your own personal vision of creating a better future for kids in the world and for your own children and grandchildren? Last night the President ended the State of the Union address by quoting an employee of a small Michigan company who said "We're a little company but we do big things." If you've read any of the articles I've posted you'll see that Cabrini Connections, Tutor/Mentor Connection is a small organization with a big vision, and a growing impact. On the national level, a Mentoring Summit just ended in Washington, DC, and big corporations have made a pledge to support mentoring. First Lady Michelle Obama was quoted as saying "The idea that we have behind all these initiatives isn’t simply to create a series of one-time experiences for just a small number of kids. It’s about encouraging more caring adults to step up and make mentoring a part of their lives." 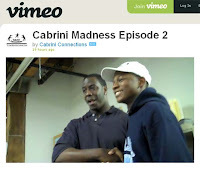 At Cabrini Connections we're launching our 2nd Annual Cabrini Madness event,where volunteers, students and friends form teams and compete to see which team can raise the most money for CC, T/MC by the time the NCAA basketball championship game is held in early April. Last year 112 students/volunteers raised over $23,000. I was invited to be part of one team, and sent the following message to the leaders. I hope that this will be passed on to corporate leaders who are making a national commitment to support mentoring. These use the "wheel" as a common image. Below is a chart I first created almost 16 years ago. It still is the model for a mentor-rich organization that seeks to have a long-term impact on youth and volunteers involved. One way to look at this is as the "student" at the hub of the wheel. In this case the spokes would be pointing to the different people and different influences that would help that student through school and into a job. 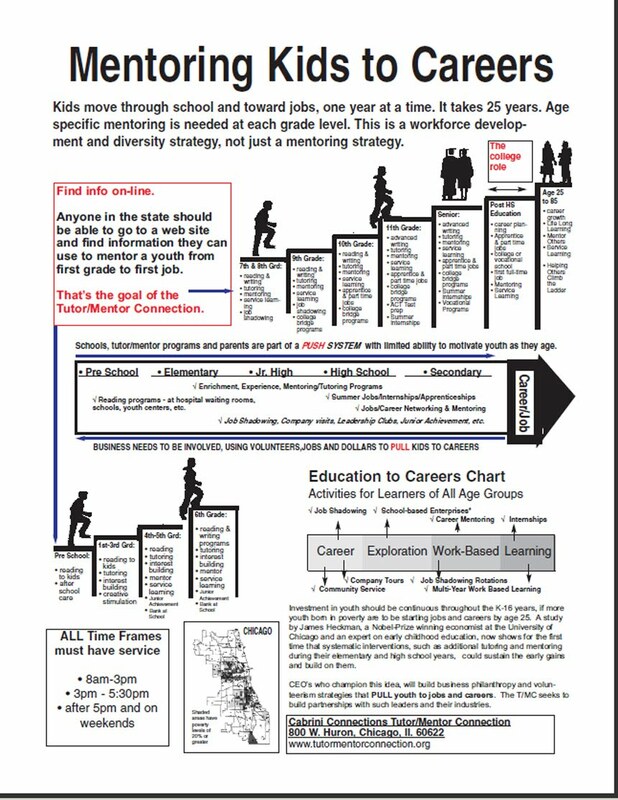 Note that if you start mentoring a youth in first grade it takes 12 years for that student to finish high school. The major challenge to non-profits offering mentoring and learning support is to find the on-going FUNDING needed to provide consistent, age-appropriate learning and mentoring for this many years. 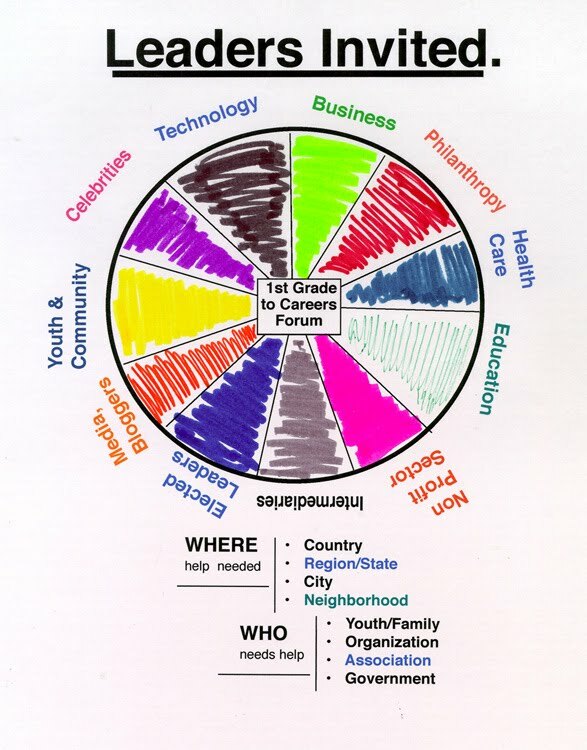 Another way to look at the "wheel" is that the hub is a "place" like Cabrini Connections and the spokes are all of the volunteers who participate each week. Together we reach more kids and offer more diversity of career modeling and support. This video gives a tour of Cabrini Connections. 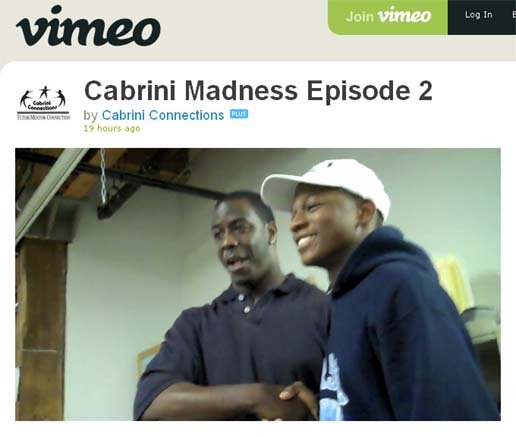 Program walkthrough from Cabrini Connections on Vimeo. In Cabrini Madness the hub of the "wheel" is each student, volunteer and team and the spokes lead to the people they know and networks they are part of (work, family, college, faith, etc.). If during the first three months of each year we can show people in our networks how important it is for them to help us, some will send donations, and some groups may organize activities on a year-round basis that help us. One example of this is the Lawyers Lend A Hand Program in Chicago which is now raising money and visibility and awarding over $200,000 in grants to different tutor/mentor programs each year. In 1994 when I first reached out to them with a vision of supporting tutor/mentor programs all over the city , they were giving one $2k grant.....which went to Arne Duncan's Ariel Tutoring Program in Hyde Park. We need a "lawyers for Cabrini Connections, T/MC" group that has people in the legal community working each week to recruit volunteers and donors to support our efforts. 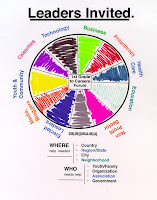 We also need support from every other industry shown on our "business wheel" so we have a diverse mix of volunteers mentoring our kids, and a diverse mix of funders making sure we have the resources needed to support their employee volunteers and constantly improve our impact on kids. 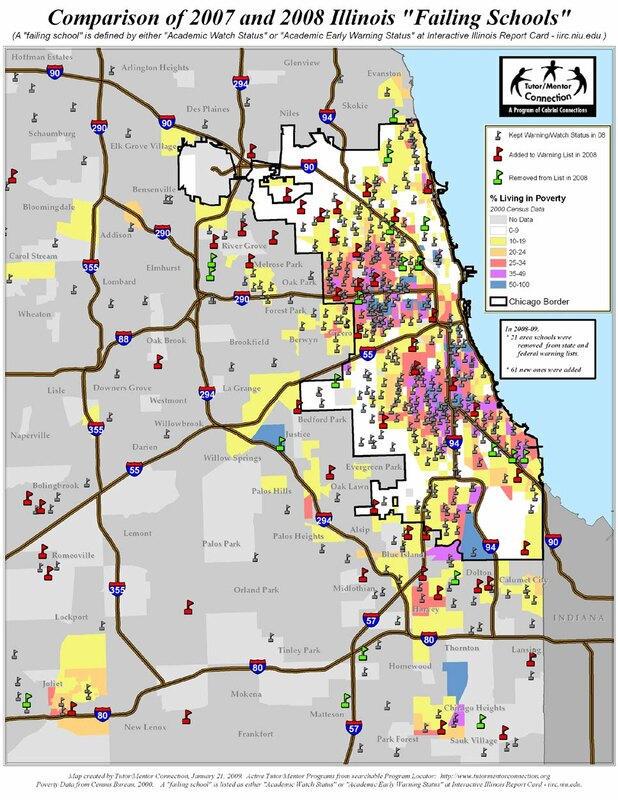 However, Chicago and America, need corporate and political leaders who use maps like we show here and here to develop leadership and program support strategies that enable tutor/mentor programs to grow and reach youth in all of the neighborhoods with high poverty and poorly performing schools. Using business maps in their planning, companies can develop strategies that reach many parts of a city, instead of just supporting a few well-known programs. As this article says "The problem is not public schools, its poverty". If our students and volunteers tell their stories of involvement in Cabrini Connections, or in any other tutoring/mentoring program, using blogs and videos and in other creative ways, they can attract the attention of growing groups of people who may support us throughout the year. However, if corporate American and the President, Governor and Mayor adopt these ideas they will begin to provide the consistent resources that every tutor/mentor program in America needs to connect kids and volunteers with each other, and with extra learning and enrichment (see our Success Steps) so that by 2015 the nation will begin to see an eruption of kids from poverty neighborhoods who are leaving high school better prepared for 21st century adult responsibilities and jobs. Mr. President, we're in your home town. You spoke at the Tutor/Mentor Leadership and Networking Conference in 1999. Your Secretary of Education led a non-school tutoring program. I introduced the T/MC concept to your wife almost 15 years ago when she was at the University of Chicago. I'd be happy to help you learn to adopt and use these ideas. You can help us do big things with them. Below is a video featuring many high profile African American entertainers and sports figures giving a message of education as the path to opportunity. If you're a parent, teacher, mentor or big brother, try to get the kids you are working with to watch this. a) if the teachers in inner city schools don't know this video exists, or are not interested in showing it, how will the kids see it? c) if there's a Boys & Girls Club, non-school tutor/mentor programs and/or YMCA with technology and youth workers in the neighborhood,they could be showing this to the kids who attend, but many neighborhoods don't have such programs. So, what are the celebrities who are featured in this video doing to help create revenue and visibility streams that provide the resources to youth serving organizations in inner city neighborhoods so that kids not only see this video, but have men and women in their lives to help them understand the message and incorporate it into their lives? Introduce those leaders to the Tutor/Mentor Connection and they can use our ideas and their visibility and power to help make tutor/mentor programs available in more places. Here are a few places where the Tutor/Mentor Connection is mentioned and/or active in the discussion. We The People blog, written by Jordan Hesterman. 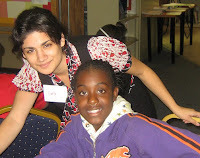 This year-end recap shows how she was active in the 2010 Tutor/Mentor Conferences. The Adler School of Professional Psychology Blog - this article points to the blog being written by Joseph Kruel, who is doing a six month internship with the Tutor/Mentor Connection. I-Open - skim articles on this Facebook page and see how this group based in Ohio is sharing T/MC ideas with its followers. Social Edge, Dictionary of Links discussion - this is a way that T/MC shares ideas with social entrepreneurs around the world. I often do a Google search for different combination of "tutor mentor" such as "mentor collaboration" just to see the many different places where I've been active or where others are pointing to our web sites. Often times I'm surprised to find that people in different parts of the world are sharing our ideas. My purpose is to find ways to increase the frequency of our stories and the number of people we reach so that we can find donors, benefactors, leaders, university partners, etc. who will help us achieve the mission we've set for the Cabrini Connections, Tutor/Mentor Connection programs. 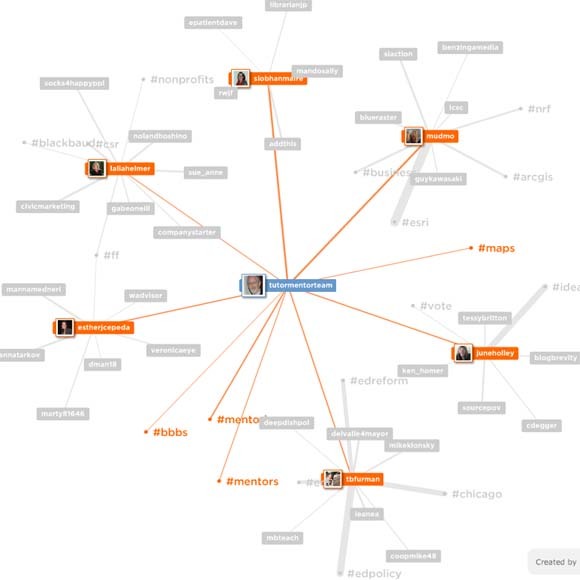 This link goes to a Twitter Mention map where I created this graphic showing people I've been connecting with recently. If I create a map like this on the fourth Monday of each month in 2011 it should show how my network grows. Since the embedded link is live, I suspect this will change every day I created a static image using a screen shot and Adobe Photoshop. Compare this to the live map each time you look at the blog and see how the network changes based on my activity on Twitter. Anyone else using this to map your network-building efforts? My emphasis was on the marketing and infrastructure development needed to support the growth of high quality tutor/mentor programs in any city. The leadership to make this happen could be taken by a school, a business, a hospital, a non profit, or a combination of all of these groups. These leadership ideas can help. We'd like to be your partner and/or consultant so you can learn from us and borrow concepts we've been developing for the past 35 years. Tipping Points - Do You Agree? The purpose of the Tutor/Mentor Connection blog is to share ideas that help more volunteers connect with inner-city k-12 youth in structured, volunteer-based non-school tutor/mentor programs. I've lead a program like this for 35 years which is where my ideas come from. You can browse the Cabrini Connections web site and borrow any ideas you want from what we share. 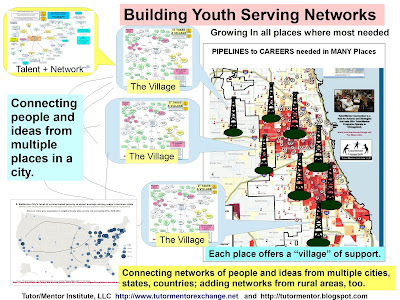 If you agree that it takes an organized structure like we try to provide at Cabrini Connections to enable volunteers from beyond poverty to connect and stay connected to kids living in poverty, then wouldn't the next logical step be to think of strategies that would make such programs available to more kids in the entire Chicago region? On January 25 a National Mentoring Summit will be held in Washington, DC. The T/MC won't be represented because we don't have the money to attend. Yet, our ideas can be represented by the way we share them via the Internet. Here are a few ideas I'd like to have people think about. First, if we want great tutor/mentor programs to reach kids in all poverty neighborhoods, we need to find ways to help each program that is operating get a more consistent flow of operating resources. 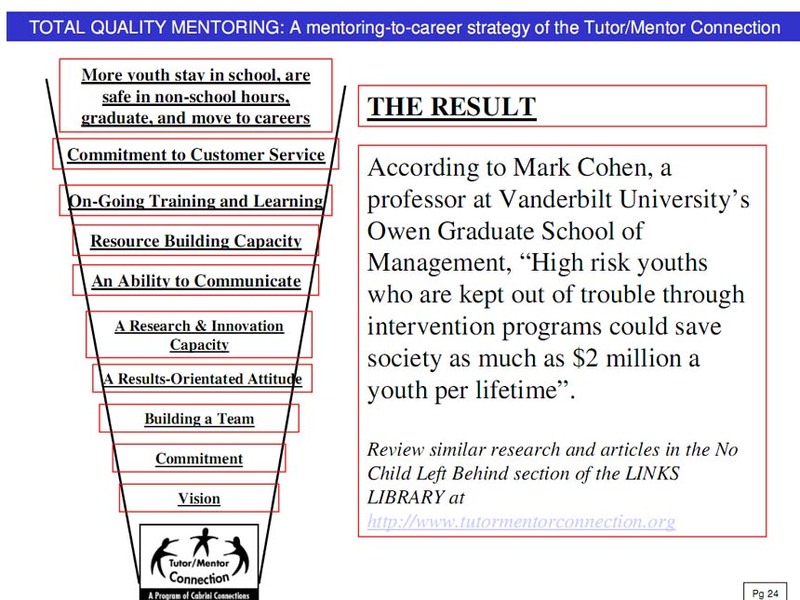 Second, we need to support intermediary organizations in each city who will maintain a database of existing non-school tutor/mentor programs, and share this on map-based directories like the Tutor/Mentor Connection does. 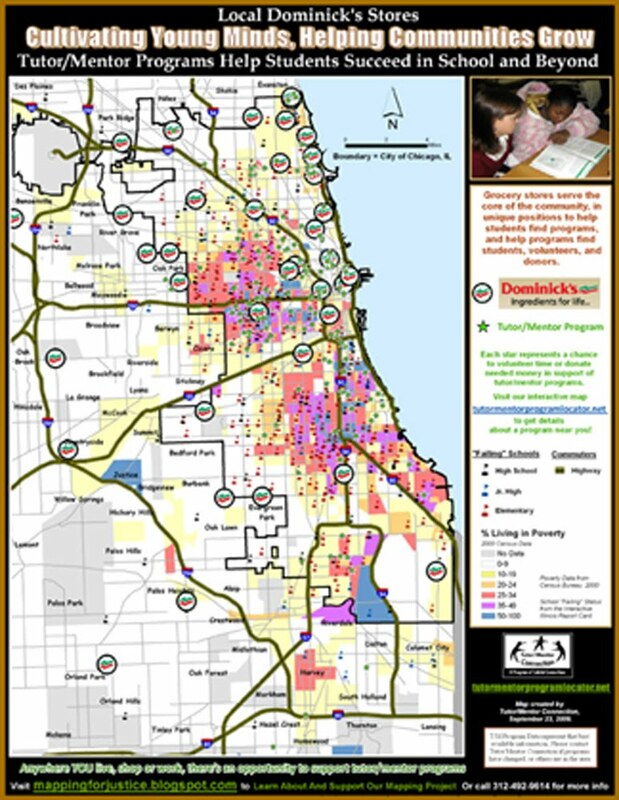 With the map anyone in the city can see where poverty and poorly performing schools are located. These are areas where kids, families and schools need more help. 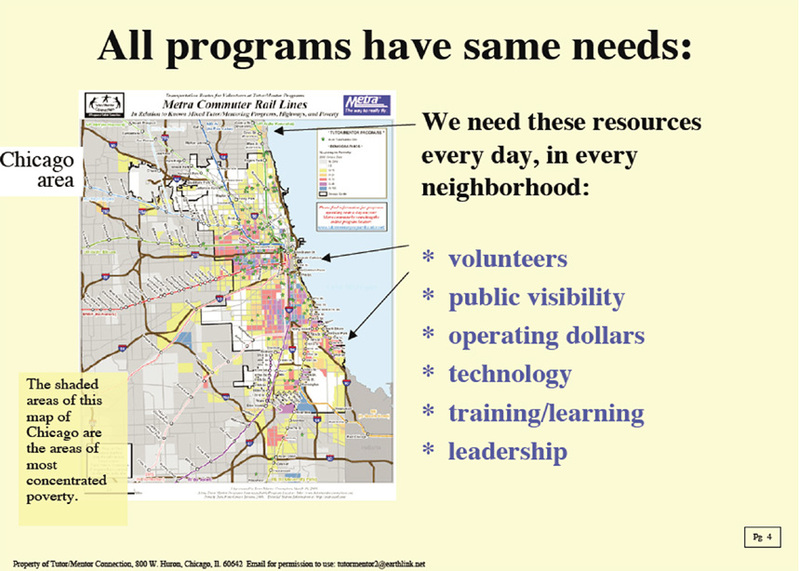 Tutor/Mentor programs cannot grow in all of these neighborhoods if they don't get more consistent help. Third, we need to be finding ways to sustain this strategy for decades, not one to three years. This chart emphasizes that it still takes 12 years to go from first grade to 12th grade. How many donors maintain consistent funding to an agency for that many years? Logic Model - If you agree with the logic, help us make it a reality. 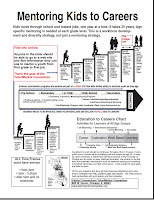 Tipping Points - What are some of the actions that could dramatically change the availability and impact of programs helping youth born in an inner-city neighborhood be in a job and starting a career by age 25? I encourage you to visit our Tutor/Mentor Forum and see how interns are helping us communicate these ideas in new and more creative ways. Join the forum, add your own ideas, and apply this thinking to help an entire city of tutor/mentor programs grow in Chicago and other cities around the country. The problem is not public schools; it is poverty. I encourage you to read this article, titled "Got Dough? How Billionaires Rule Our Schools". Then review strategies and ideas the Tutor/Mentor Connection proposes to expand the network of support for youth in high poverty neighborhoods of Chicago and other cities. You can use this blog as a text book if you like. Each category on the left expresses a set of ideas. All categories are interconnected in one over-arching strategy. If it's your first time visiting the T/MC and you are overwhelmed by the amount of information, start here, or here, and spend time each week throughout the year building your understanding of the information we share. Want to help youth living in high poverty? The Tutor/Mentor Connection (T/MC) collects and shares information that anyone can use to build personal and/organizational strategies that reach more k-12 youth living in high poverty areas and help them stay in school, stay safer in non-school hours, expand their network of adult support, and move toward graduation, advanced education and to jobs and careers. We focus on actions that need to be repeated over and over for many years in many places of Chicago and other cities. 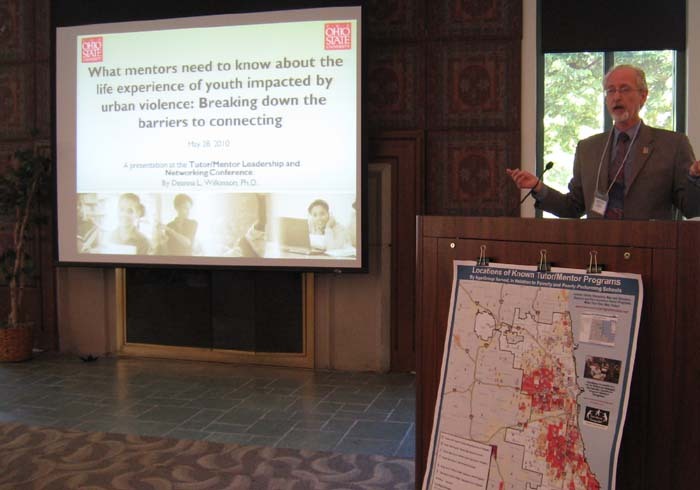 Such actions would lead to high-quality, mentor rich programs operating in inner city neighborhoods. The information we share is intended to be used by our own volunteers, students, staff, leaders and donors at Cabrini Connections, the program we lead. It's also intended to be use by others in the for-profit world, education, and the non-profit world. In fact, if leaders in business, religion, health care and universities adopt this leadership strategy, employees can form tutor/mentor support teams using the ideas we share. As we enter a new year and a new decade staff and volunteers at Cabrini Connections are beginning to plan 2011 events. In a meeting last night someone asked "what roles are we looking to fill on the year-end dinner committee?" 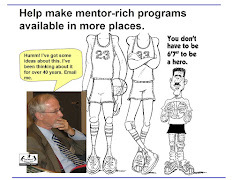 Since we want to empower many teams of volunteers and students to support different activities and events throughout the year, I thought I'd share some ideas that I've learned over the past 35 years of leading a volunteer-based tutor/mentor program. I'm not going to write a long blog article, instead I encourage you to open this pdf and use it as a guide in forming teams that want to have an impact. 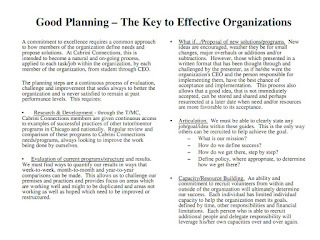 Here's a screen shot of one of the pages in this pdf which focuses on good planning. 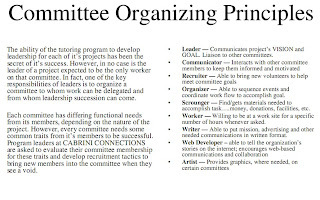 This page focuses on types of talents that need to be part of an effective committee. Do you have someone who can be the project manager for your committee? Or someone who is an effective communicator? Perhaps the most important role is that of a "recruiter" who can find people with these talents and bring them onto a committee or a board. 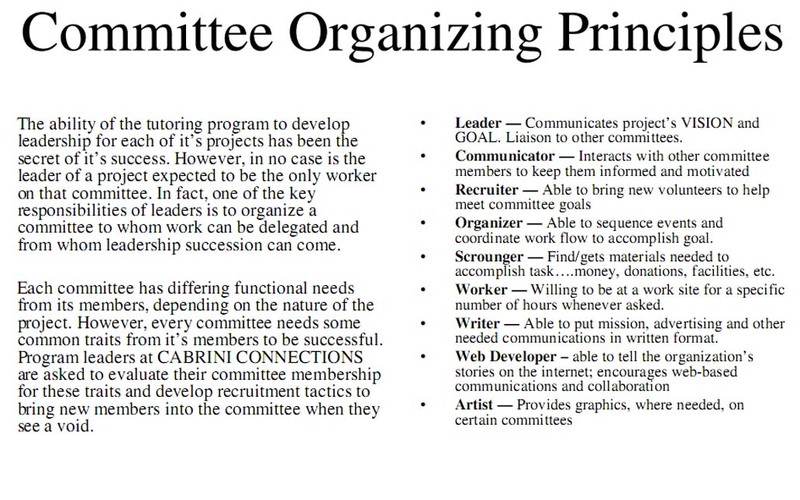 If you want to help Cabrini Connections, Tutor/Mentor Connection please take a look at this planning guide and identify the skills and talents you might contribute to one or more of the project described on this list. If you're with a company and can form teams like this, your team can help Cabrini Connections and every other tutor/mentor program in Chicago and other cities by the way it mobilizes resources and points them to individual organizations. If you find these ideas useful please let us know. If you can help us share them, or can help provide the funding that goes into developing them, we'd like to hear from you. I read this article today, showing how we need to trigger an emotional connection in order for social media to result in an outpouring of support for a product, service or a social cause like tutoring/mentoring. This led me to thinking of a campaign we might launch in 2011. What crazy things are you willing to do to support Cabrini Connections, the Tutor/Mentor Connection, or your own favorite tutor/mentor program? I'd stand on my head, or create a photo that looks like I am. What would you do? How would you use video, animation, social media, to share your story? Don't just think about it, do it! National Mentoring Month - Who Mentors Business? During January Mentoring Month different celebrities and media will be talking about Mentoring and how it enriches the lives of youth and volunteers who become connected through organized mentoring programs. 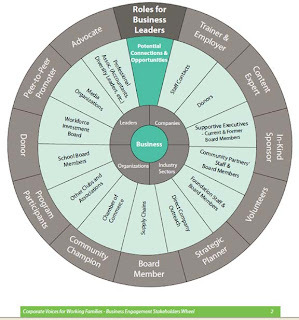 I found this graphic in a planning tool titled Business Engagement Shareholder's Wheel. This is one of a series of training materials provided by Corporate Voices for Working Families. As we celebrate mentoring, I encourage volunteers to organize study groups within their companies, colleges and faith groups, so others can learn how important it is to provide a steady flow of resources to support high-quality, constantly improving, tutor/mentor programs in every part of every city in America. The Leadership Ideas that we share through the Tutor/Mentor Connection are intended to encourage people who can provide time, talent and dollars, as well as jobs and other types of community support, on a proactive basis, to all the different tutor/mentor programs operating in the same space. Instead of thousands of non-profits trying to find a few donors, how about innovating ways that thousands of donors are reach out to find ways to support the non-school tutoring/mentoring programs that enable these connections between youth and volunteers to take place? 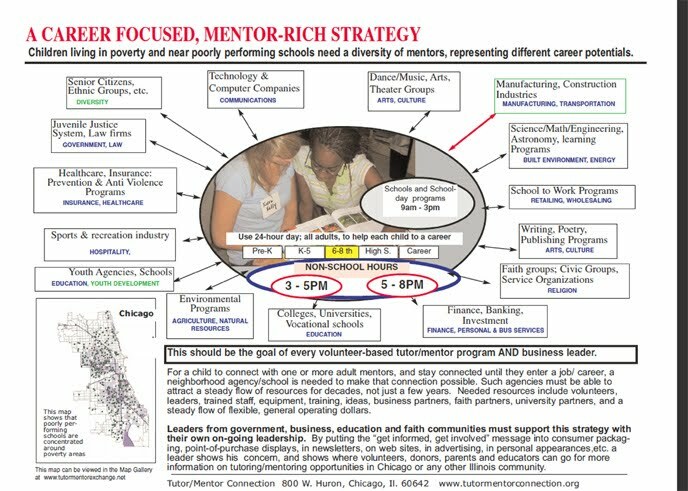 In Chicago you can use the Tutor/Mentor Program Locator to search for programs by zip code or by sections of the city. On the National Mentoring Partnership web site you can enter a zip code and find programs throughout the country. Cabrini Connections is one of those programs in Chicago that could benefit from more consistent donor support throughout the year. If volunteers carry this message back to their networks they can generate this type of support with the stories they tell about their own mentoring experiences. I encourage you to read this New York Times article by Nicholad Kristof which says "There’s growing evidence that the toll of our stunning inequality is not just economic but also is a melancholy of the soul. The upshot appears to be high rates of violent crime, high narcotics use, high teenage birthrates and even high rates of heart disease." He's pointing to a book by two distinguished British epidemiologists, Richard Wilkinson and Kate Pickett. I followed the links and came to a web site called The Equality Trust which shows that "large income inequalities within societies damage the social fabric and the quality of life for everyone." 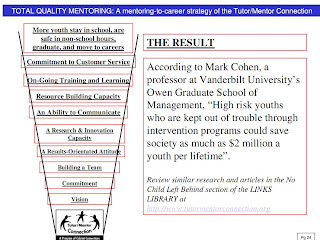 The maps we show on this blog and at Mapping for Justice, as well as the poverty and social capital articles we point to on the Tutor/Mentor Connection sites emphasize this point. They also are tools that people who don't live in poverty can use to help create programs and services that bridge the gaps between rich an poor. Volunteer-based tutor/mentor programs located in high poverty areas, like Cabrini Connections, can be places that connect youth and families from poverty with ideas, experiences, ideas and adults from non poverty areas. 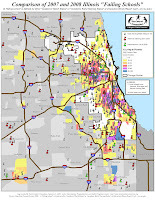 You can learn what programs operate in Chicago using the Interactive map and Program Links provided on our web sites. If you compare programs you can begin so see which have more comprehensive and long-term strategies than others. 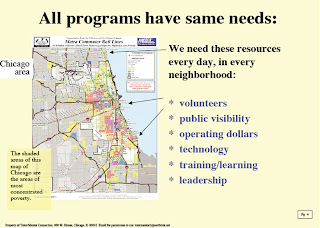 You can borrow ideas from one or more on a continuous basis, so over time every neighborhood has world-class programs. That can only happen if resource providers are actively engaged in this process and if intermediaries like T/MC are funded so they can host this information and bring people together on a continuous basis. January is National Mentoring Month. Pick one or two programs and make a commitment to support them with time, talent and dollars for the next few years. Set aside part of your support for the Tutor/Mentor Connection so we can support your efforts. New Year. New Decade. New Hope. Happy 2011 to all of you. I hope your year is full of good health, happiness and prosperity. I hope that all of those who read the articles posted will find the messages of the past year inspirational, informative and useful to you. I hope you'll use the tags like chapter titles, and will read through past articles. If you're a teacher or volunteer leader I encourage you to use this as curriculum to teach students to identify problems, propose and define solutions, and mobilize people to work with them to put those solutions into practice. There are many heroes to look to for inspiration. I've been a GIRAFFE HERO since 1997. Like the Tutor/Mentor Connection, this organization finds it difficult to find donations to support its intermediary and leadership role. I hope you'll help them, as you help me. 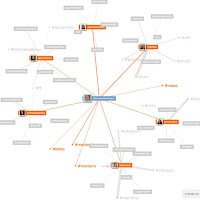 In fact, the links we point to in all of our articles, and that we connect with our information maps, point to thousands of social entrepreneurs that need consistent, flexible funding in order to do the work they do. This is our challenge in 2011. We need to create blueprints showing all of the sub-contractors and workers that need to be involved in helping youth move from birth to work. We also need to find ways to create daily visibility that can compete with sports, music, reality tv, politics and other media, to draw eyeballs to our information, and dollars, volunteers and talent to all of the different organizations who enter 2011 competing with each other to find these resources. If we can find ways to do this in 2011 and the next decade we can move a bit closer to closing the poverty gaps and fixing some of the problems that we face. These blog articles and our email newsletters are always intended as and INVITATION for any reader to reach out to us, join our T/MC Collaboration forum, invite us to your planning forums, or share this information with your own network. The T/MC OHATS is a place some of us can document what actions we take that will lead to more and better tutor/mentor programs reaching inner city kids. If you'd like to be added as a recorder, or if you're a writer who can help us make sense of this data just reach out to us. We're a small non profit with a big vision. This map shows the range of talents we seek to work with us as volunteers and partners. If you're trying to keep a New Year's Resolution about making a difference in your community, or the world, we can help you and you can help us.